These silver aluminum outdoor frames are great for placement next to the entrance of any business. 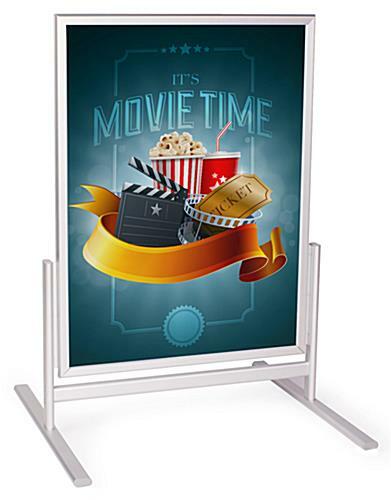 The portable sidewalk displays are designed to showcase 22” x 28” graphics to be easily seen by passersby. The outdoor frames with durable construction are able to withstand wet weather and use clear plastic lenses to keep out dirt and vandals. The sandwich boards are outfitted with snap open and close borders to help make signage changes fast. The frames come with legs that help to keep the unit stable even in busy locations. The portable sidewalk displays are able to be carried around for securing the sandwich boards during severe weather or at night when your business is closed. 27.3" x 37.0" x 24.3"